In my earlier blog, I mentioned about the combination of Lapatinib and Trastuzumab for breast cancer treatment. 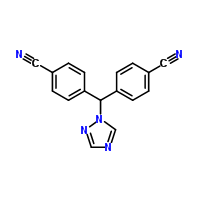 Now FDA has approved Lapatinib in combination with Letrozole (see structure ; Letrozole trade name Femara, an oral non-steroidal aromatase inhibitor for the treatment of hormonally-responsive breast cancer after surgery) to treat hormone positive and HER2-positive advanced breast cancer in postmenopausal women for whom hormonal therapy is indicated. This drug combination of Lapatinib & Letrozole provides women being treated for advanced breast cancer with an important treatment option. The entirely oral treatment regimen works by targeting both HER2 and the hormone receptors, thereby slowing the cancer cells' ability to grow or spread. As per the claim by Dr. Richard Pazdur, (Director, Office of Oncology Drug Products, FDA's Center for Drug Evaluation and Research) women with HER2-positive disease receiving the Lapatinib plus Letrozole combination more than doubled the time they lived without the cancer progressing compared with those receiving Letrozole alone (35 weeks vs. 13 weeks). Closantel for treating river blindness ?